Sony on Monday has launched MHC-V50D one-box portable audio system in India for Rs 33,990. 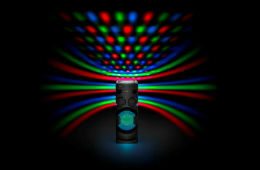 Some notable feature of New Sony's speaker are party lights, karaoke mode, Motion Control and DJ effects. The new audio system can be purchased from Sony Center as well as all major electronic stores, across India from July 13 onward. The Sony's MHC-V50D audio system come with guitar input feature that allow its user to plug in their guitar to enjoy the powerful sound through the speaker. It also features Karaoke mode and allow two mic inputs, plus scoring and sound effectsfor a smooth karaoke setup. A built-in vocal fader function even turns down the voice on CDs, so one can sing all favorite songs. Sony MHC-V50D audio system can connect to the smartphone via Bluetooth. It also feature the Motion Control technology that capture the smartphone gestures such as simple left and right shake to change tracks; play and pause favorite tracks and also manage the volume control. Another notable feature of the New Sony Speaker is built-in party lights. "Lights are directed through a lens to spread a wide light pattern. One can control the lights on the system, and watch them sync to the beat of the music for a club-style dance floor at home"
The speaker also feature the LED touch panel that makes it easier to control music playback and space illuminating lights beams multi-colored light from the ceiling to the floor in time with the beat. It also comes with a DJ function that can be used to add effects to music, voice and lighting. It helps control the colors of the speaker’s light and sync the same to the beats of the song. The DJ and light function can be controlled with a smartphone app named Music Center app. The Company claims that MHC-V50D speaker guaranteed produce 660W audio output. As the name itself speak MHC-V50D one-box portable audio system light weight, and compact in design. It can also be connected with other sony;s one-box systems to amplify the sound and create a audio chain effect. Connectivity options includes built in DVD/CD player, USB port, audio input, an HDMI output, a built-in FM radio tuner, NFC & Bluetooth. Just to remind that, Sony's MHC - V44D one box audio system in August 2016 for Rs 29,990. MHC - V44D share the same spec of MHC-V50D but it lacks the few features likes Guitar input, touch panel, gesture control also it product only blue color speaker light whereas MHC-V50D is capable of producing multi color speaker light.